One of the most urgent issues of our time, climate change has widespread implications — from the exacerbation of poverty, to the breakdown of infrastructure, to the loss of environmental, political, economic and social security. Experts agree that climate change threatens to set back development efforts by decades, placing least developed countries and already-vulnerable populations in an even more precarious position. The latest Intergovernmental Panel on Climate Change (IPCC) Fifth Assessment Report (AR5), signed off by almost 200 nations, concludes with 95% certainty or more that humans have caused the majority of climate change since the 1950s. It predicts global surface temperature to continue to rise, along with increased sea level rise, melting of glaciers and ice sheets, acidification of oceans, increase in the intensity of tropical storms and changes in precipitation patterns. In other words; the science on climate change is clearer than ever, and so is the urgency for human action. As a global community, we all have a role in developing and implementing solutions toward significant transformation in our development patterns. It requires not only a shift in awareness and accountability for our own individual choices but in a social, political and economic shift towards enabling conditions for these sustainable choices to be made– and in turn, a more just, equal and healthy planet. “The IPCC report says it clearly: climate change is happening and humans are causing it. Countries must commit to greater CO2 emissions reductions before 2020, produce real funds for adaption in developing countries, innovate, design and implement safe and equitable mitigation solutions that contribute to all aspects of sustainable development, and make progress on addressing loss and damage. We also remind political leaders that policies for tackling climate change must respect the human rights of people – or they will neither be just nor effective“, says Bridget Burns of WEDO. The IPCC report also shows climate change will hit poor countries hardest. Read the Guardian’s comment here. The impact of climate change is already causing widespread socio-economic and environmental loss and human suffering around the globe. Climate change erodes human freedoms and limits choice. However, the impacts of climate change are not felt equally. Without measures to address the injustice of climate change, those with the fewest resources, countries and individuals alike, will be most susceptible to its negative effects; and those in positions of wealth and power will be the first to benefit from transitions in the economy towards a low carbon society. Climate change impacts and solutions, when viewed through an intersectional lens, encompass a wide diversity of experiences due to age, ethnicity, class, and in particular, gender. Gender is a social construct. While not immutable nor universal, gender shapes expectations, attributes, roles, capacities and rights of women and men around the world. 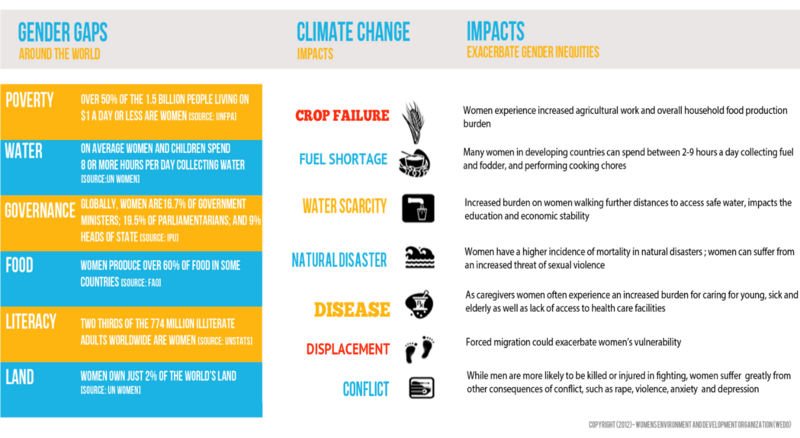 Climate change affects everyone, but women and men experience the impacts differently, and women are often disproportionately negatively affected. Women, compared to men, often have limited access to resources, more restricted rights, limited mobility, and a muted voice in shaping decisions and influencing policy. At the same time, gender roles generally ascribed to women such as informal, reproductive work often relate to caregiving for households and communities, caretaking of seeds and soils, maintaining traditional agricultural knowledge, and responsibility for natural resource management such as firewood and water, and thus these roles create opportunity for engagement as women bring diverse and critical solutions to climate change challenges. Women’s leadership in all aspects of decision-making. WEDO tracks the United Nations Framework Convention on Climate Change (UNFCCC) – the international environmental treaty to combat climate change.